Empty Hanamikoji Dori street in Gion district in morning sunrise with closed shops, restaurants and tea houses built of wood in traditional Japanese architectural style. Hanami-koji, Gionmachi Minamigawa, Higashiyama Ward, Kyoto, Japan 2017. Rights-Managed photo of Japan travel photography of Empty Hanamikoji Dori street in Gion district in morning sunrise with closed shops, restaurants and tea houses built of wood in traditional Japanese architectural style. Hanami-koji, Gionmachi Minamigawa, Higashiyama Ward, Kyoto, Japan 2017. 花見小路通 祇園 ぎおん 京都 日本 旅行写真 This image is available for licensing for a variety of editorial and commercial uses in publications, designs, web and social media. 6000x4146 px, 71.17MB uncompressed / 12.03MB jpg. Need larger? 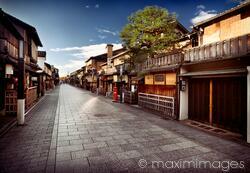 This Rights-Managed stock photo 'Empty Hanamikoji Dori street in Gion district in the morning Kyoto Japan' is created by Alex Maxim and can be licensed for your advertising, corporate, editorial or other use. Click 'Buy Usage Rights' to estimate the license fee and add the image to cart. Licensed files are delivered electronically as soon as the payment is processed.